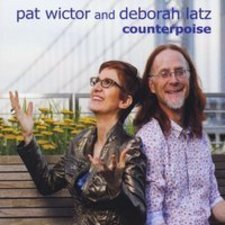 Pat Wictor and Deborah Latz first met at an improvisational singing workshop led by Bobby McFerrin, and their musical collaboration is all about spontaneity and surprise. Coming from two different musical realms - he from the acoustic singer-songwriter world, she from the jazz and performance art scenes - they meet over their shared love of melody, poetry, and possibility. Wictor first became known for his slide guitar playing and innovative re-imagining of traditional and contemporary songs. He spent most of the last seven years touring all over North America as one third of the acclaimed harmony-driven trio Brother Sun. New York-based jazz singer, songwriter, arranger, and actress Deborah Latz brings a fresh sound to every performance. She can move from a deep and soulful ballad, to scatting on a bebop tune, to trading fours with a hip hop artist, all the while delighting audiences with her personal warmth and consummate musical skill. This new collaboration promises to evolve in exciting ways as they explore new facets of their artistry.